Traditional Chinese medicine (TCM) can be a bewildering science to make sense out of, and not just for foreigners. Prescriptions offered by TCM gurus are increasingly thought of as archaic to today’s younger Chinese, but perhaps that’s because they’re not old enough yet to soak up the real benefits of the practice. 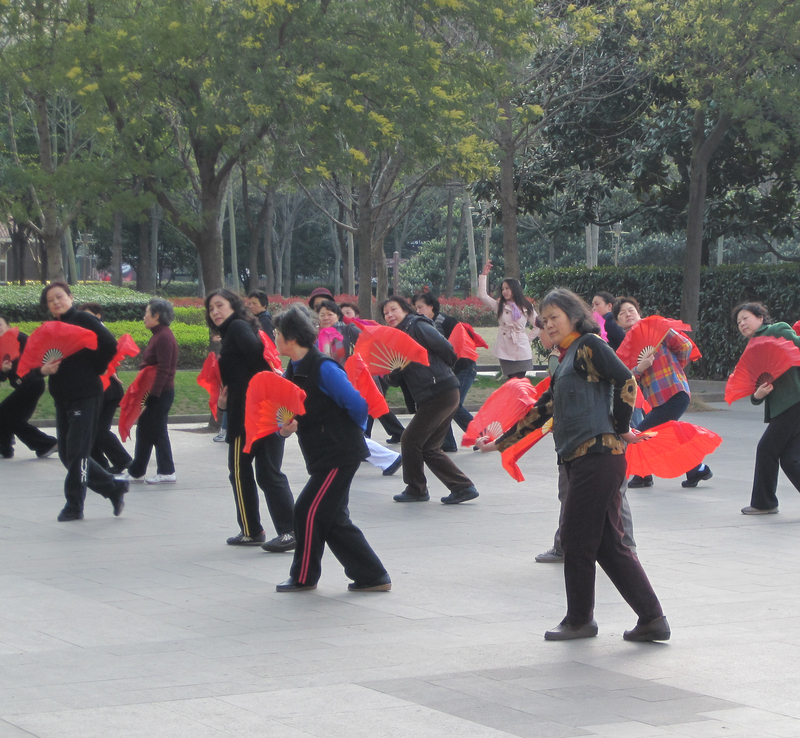 Catching myself at that uncertain hour between very late and very early, I’ve often stumbled upon elderly Chinese in the midst of rigorous kicks, swivels and dances. One day, after enough head scratching to create a small bald patch on my scalp, I contacted Dr. He Jinsen of the Shanghai University of Traditional Chinese Medicine in hope that he could give some answers to feed my curiosity. Yesterday I published a list with CNNGo (appearing with the overly exaggerated title, “10 TCM moves to help you live forever” — a choice I assume was for the sake of generating extra hits) that offers some explanation to why elderly Chinese jump into an array of calisthenics and dances hours before most of the white-collared working class get up for their morning coffee. My interview with Dr. He was conducted off of West Nanjing Road in an outpatient acupuncture clinic accented with a light-brown bathroom-tile facade — most likely the same kind gathered from the surplus stock contractors scooped up decades before as economical building materials. Me and my translator Abby, a TCM student from Taipei, were lead into a large off-white room just beyond the main corridor. The area was divided with wobbly brown dividers that gave privacy — at least the sense of it — to acupuncture patients on beds behind them. Several doctors (I assume so because of their freshly bleached gowns) sat at two wooden tables pressed up against the wall rapidly jotting down notes in the illegible script only a medical doctor can produce. I was instantly greeted and offered a chair in between two of the oldest looking doctors that were too busy to take their eyes off what they were so vigorously spelling out. After he dotted his last sentence, Dr. He looked up at me and gave me a salutational nod that seemed to say: Hello, and where should we begin? I jumped right into the aim of the interview, occasionally leaning on my translator, mostly to work out what the doctor was saying to guarantee no mistranslations. Even more surprising to Abby was that shouting, according to Dr. He, was “good for the heart and lungs.” It’s not she didn’t give a hoot; she just didn’t get it because the key benefits from most TCM exercises are done to aid aging organs. In time, she admits, perhaps some of them will be useful, even if you look slightly ridiculous while doing them. Cool Post, I had my first period when I was a little younger than eleven. For the first years, it was fine, and I never felt any cramps. Then, out of the blue, I would have very bad cramps that would sometimes take me out of school. My parents have taken me to countless doctors, but their medicine (traditional chinese medicine) did little to help, and I resorted to taking painkillers and dumping those medicine in the sink. Some people tell me that a change in lifestyle can stop menstrual pains, and I started exercising regularly this year, because as a high school Junior, I’m not required to take PE anymore, but I didn’t want to get fat, so I run for about an hour everyday at 6mph. My doctor told me that before, I wasn’t really ovulating, but now I am, and the cramp stopped around August last year. Somehow… I don’t know. It doesn’t explain why the cramps came at age 14 and stop when I’m going on 17. From a medical standpoint, what really happened?